By now, we take it as a given that brands should have a lively presence on social media. However, the importance of social media analysis is not that well-understood. It is a phrase that comes up when you have to justify your social spend or when you are trying to figure out what RoI you are getting out of it. Without social media analysis, you are merely groping in the dark. Social media analysis is essential for every brand that maintains a social media account and hopes to benefit from it. It helps you identify what social media metric is working out in your favor, what you can do better and where you stand vis-a-vis the competition. Any digital marketing guide will stress on how central testing out your social media strategy is. Social media analysis is the first step towards identifying the best course on social media for your brand. If you still aren’t quite sure if you want to get into measuring every aspect of your social media performance, consider this. In the past couple of years, all the big social networks (Facebook, Twitter, and Instagram) offer in-house analytics to brands. Without breaking a sweat, you can see how well your content is doing on that platform. While this is to hit the point home that organic reach is not very dependable, it has some other limitations too. For instance, you need to know how much engagement your competitors are getting on these networks. Benchmarking is important because you need to make sure that you aren’t missing out on any major engagement goldmines from your industry. It also helps answer your RoI questions too! There are quite a few social media analytics tools out there that can help you perform social media analysis. 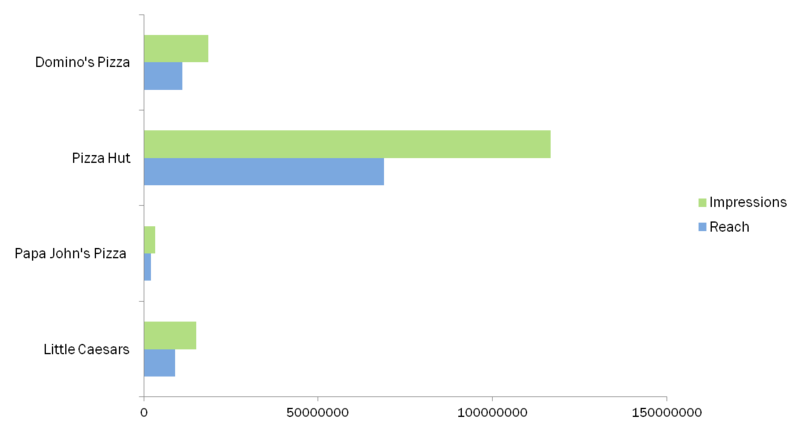 But before we get to discussing tools, let me demonstrate what insights you can derive from social media analysis. The best way to do this is to take up a particular brand. Here, let us look at Domino’s’ social media performance during the period June 01- August 31, 2016. 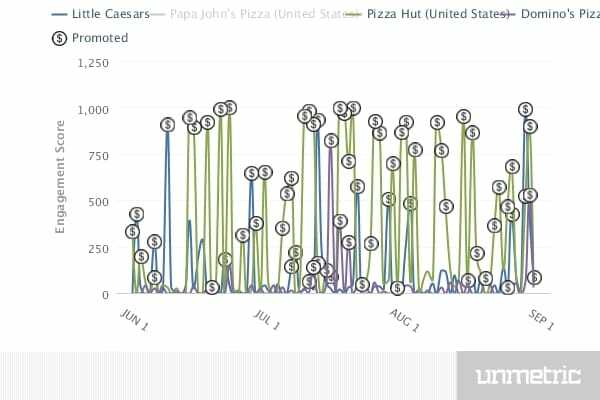 What I’ve done here is add Domino’s and three of its competitors (Pizza Hut, Papa John’s and Little Caesars) from Unmetric Analyze’s brand repository to “Competitors” group and set my time-frame. I don’t need to do much else other than make sense of the wealth of information that Analyze will provide. When you look at Domino’s social media metrics, by itself, it doesn’t mean much. I know that they posted 50 times in the three month time period, and witnessed a fan growth of over 30%. And that the pizza brand gets around 83,000 Likes and close to 9,000 shares. But there is no clear way of saying whether it is a good thing or a bad thing. Or, what social media metric the brand needs to focus on. Now, if you go over to the Compare tab, you can see the social media performance of Domino’s contrasted with that of its competitors. 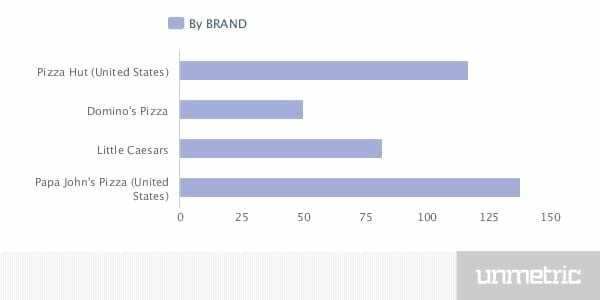 It’s evident that Domino’s has more Fans than Little Caesars and Papa John’s, but Pizza Hut has almost twice as many as Domino’s. The volume of Posts by itself does not mean much. So, I took a look at the Likes, Comments, and Shares that each of these brands got over the course of the time period studied here. On the face of it, Pizza Hut is killing it on Social Media, they are getting more interactions than all other brands together. But we still don’t know why. The social media manager at Domino’s, seeing that Pizza Hut and Little Caesars are getting more interactions, might want to do a deep dive analysis to look into their social media strategy to why this is so. You can take a look at some of the top engaging Posts from this group. 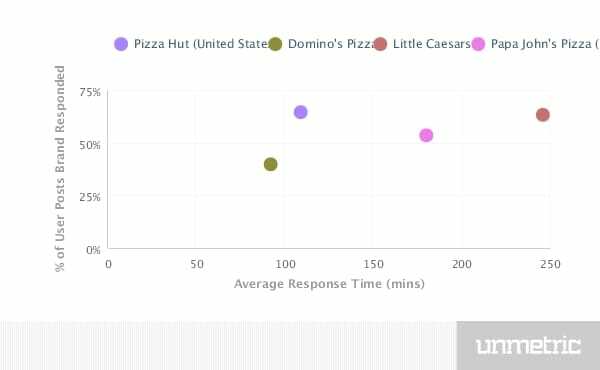 This ranks Dominos’ content based on the engagement that each of the brand Posts from the group receives. Go to Compare > Content > Share of Voice to get a glimpse of the top Posts. 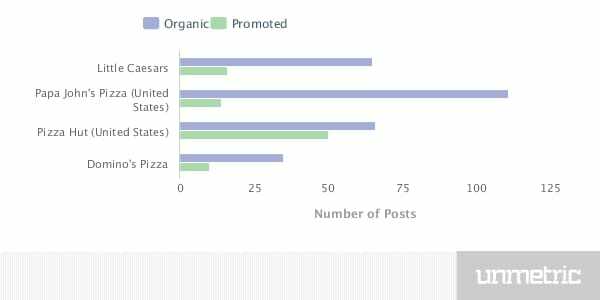 A quick look at the brand Posts arranged according to the engagement they receive indicates that Pizza Hut’s Posts are doing really well, and we know that. But what is it about these Posts that make them such engagement magnets? As sinfully delicious as that sounds, what makes these Posts so shareable? Is it that the Fans are really excited about the new menu item? I looked through some of the other most engaging Posts from Pizza Hut. Most of them feature their pizzas and dips in all their glory, with short, appealing captions. 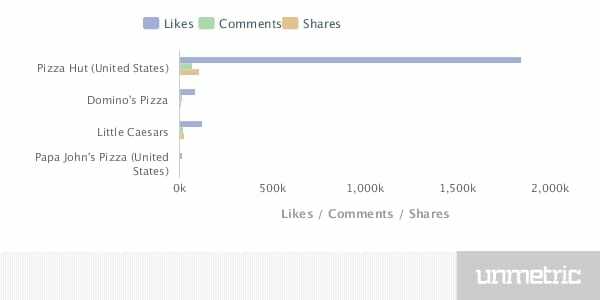 Little Caesars got a lot of engagement on one of their commercials that was shared on their Facebook page. Another thing that you will notice is that Little Caesars, like Pizza Hut, takes great pains to reply to all their Fan comments. This goes a long way in building a personal relationship between the brand and its Fans. Now that we’ve studied the content, let’s go back a little. Remember how Pizza Hut gets so many Likes, Comments, and Shares? With organic reach hitting an all-time low, most brands promote at least some portion of their content. And extraordinary levels of engagement are usually indicative of that. On average, these brands promoted a fourth of all the content that they published. 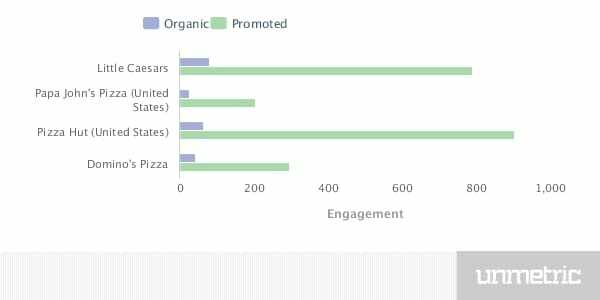 Pizza Hut’s Promoted Posts were most engaging while Little Caesar’s Organic Posts got the most engagement. Obviously, Little Caesars and Pizza Hut are promoting very heavily. Little Caesars seems to be making the most out of momentum that it gains from promotion to give its organic content a push. Before you recommend that Domino’s social media manager lobby for a greater budget for promoting all its Posts, consider how much reach they get. Domino’s gets a reach of around 11 million and 18.5 million impressions. Little Caesars, on the other hand, has a reach of close to 9 million and receives around 15 million impressions. Pizza Hut is miles ahead of both with a Reach of nearly 69 million and obtains over 116 million impressions. The average Reach of all these brands is slightly over 22 million, with them receiving over 38 million Impressions. This is, however, heavily skewed by the incredible Reach and Impressions Pizza Hut gets. Since Promotion is for the most part a strategy to improve Reach, if Domino’s is to amp up its reach, it will have to consider promoting a greater fraction of their content. This should support content that is better thought out. Smart decisions about content should be made based on what content has worked best for them in the past, and what their competitors are banking on to get engagement. Based on this social media analysis, Domino’s should focus on creating more shareable content. Instead of keeping their Posts about new offers, opting for content that Fans can actively interact with and responding to them would be the way forward. Social media analysis is all about getting actionable insights based on available data. As you have seen here, a great analytics tool will give you all the social media metrics you need to keep track of your social media performance. I’ve used Analyze here for this demonstration. Frankly, you’d be hard-pressed to find another tool which will give you so much intel and with so much ease of use. Quick look at your top line metrics. Know what Posts are bringing you the most engagement when you get the most Reach and engagement. Compare your performance with that of your competitors. Stay on top of the buzz around your industry, understand what your competitor does that you should be doing too. Drill-down. Don’t waste time looking at vanity metrics. Zoom in on your best and your worst. Identify what strategy isn’t working out for you. Likes are never the end of the story. Find out what gets someone Likes, why promotion is not working out for you as compared to your competitors. Repeat. Social media analysis is not something you do every once in a while, or as and when it comes up during a meeting. It is a constant process that feeds into, and is an inseparable part of your content strategy. Use social media analysis to narrow down on effective content types and create with that input. Save yourself a lot of worry and time by signing up for Analyze here.